Before gates open on June 21 for the 42nd Utah Arts Festival, Karen Major, who worked as a paralegal for many years, already will have created a calendar of activities, performances, films and literary events that she and her husband, Steve Sayer, who retired after working as an executive with the Electrolux group, will hang on their refrigerator door. 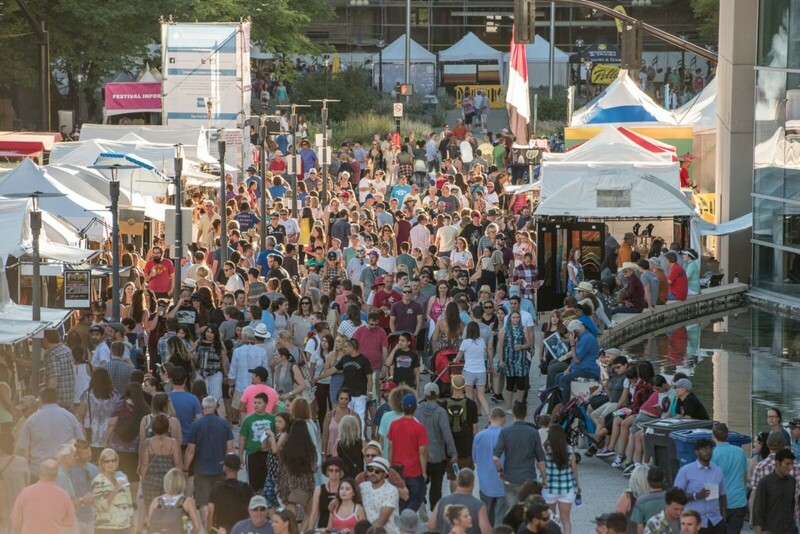 The couple, who live in downtown Salt Lake City, plan to spend most of the 44 hours during the four days the festival (June 21-24) on Library Square and the civic plaza will be open to the public. “Over the last six and seven years, we have discovered just how much more there is to the festival than just visual art,” Major says. Now, the couple try to catch as much of the festival’s multidisciplinary offerings as they can, including the international Fear No Film program of short fiction and documentary as well as the Literary Arts Venue’s extensive programming on the Big Mouth Stage, along with scores of local, national and international musicians and bands who will appear on any of the six stages. Photo Credit: Utah Arts Festival. Likewise, Harrison Smithwick will be on festival grounds every moment of the festival’s hours. Smithwick, who also is retired, is a transplant from Boston who came to Utah as a ski bum in the 1970s. 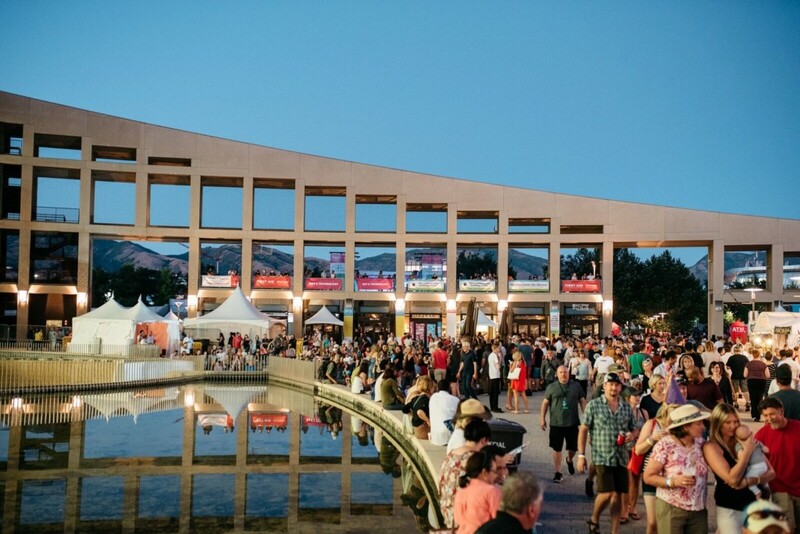 He fell in love with the festival the first time he attended in 1979 when it was held on West Temple near Abravanel Hall, the home of the Utah Symphony. “The vibe of the festival was not like anything else I had experienced in Salt Lake City up until that moment,” he recalls. Any longtime festival patron likely recognizes Smithwick. 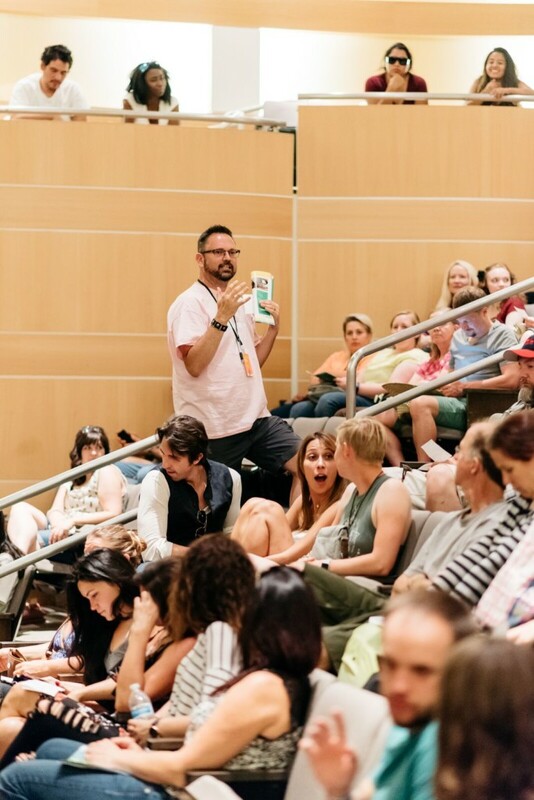 As Aimee Dunsmore, the festival’s development director, says, “he is here every moment, every single day.” He lives in Sugar House and takes the Utah Transit Authority’s S-Line Streetcar line and then transfers to the TRAX Red University light rail line to arrive at Library Square. “I have a sandwich before I leave the house and then spend the entire day at the festival,” he says. Indeed, fresh twists have been incorporated in virtually all aspects of the festival, while organizers also keep many of the event’s most popular draws. Schedules for five stages inside festival grounds are packed with performers to suit every imaginable taste and aesthetic. Meanwhile, this year, the Amphitheatre Stage will be the site of the festival’s biggest experiment – the Arts Fest Amplified Concert Series. The nightly concerts cover a versatile and diverse palette of musical tastes and influences. They include Gomez, the British rock band which has just begun the North American leg of its 20th anniversary tour celebrating its most famous album Bring It On that received the prestigious Mercury Prize when it was released in 1997. Nashville’s Ron Pope is a certified exemplar of the genre-free American musician who also manages the entire business side of his career including his own recording label (Brooklyn Basement Records). 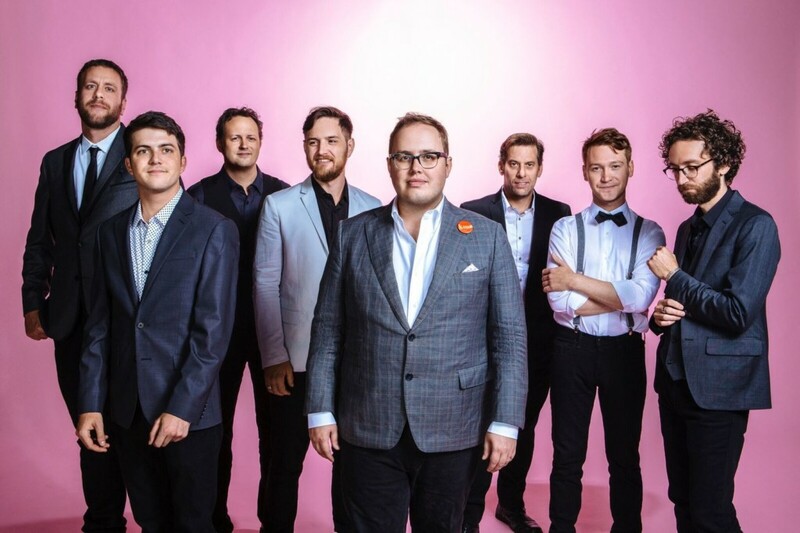 St. Paul and The Broken Bones’ generous and brassy sounds drive a convention-flipping aesthetic in its soul-infused rock songs. St. Paul and The Broken Bones. Photo Credit: Utah Arts Festival. And, the 21st century model and sounds, geared toward younger audiences, will be represented by DJ A-Trak, a Canadian musician and producer (also with his own label Fool’s Gold Records) cited by Rolling Stone magazine as one of the most important global figures in electronic dance music. Likewise, People Under The Stairs, a Los Angeles-based hip hop duo, will add its festival appearance to a tremendous portfolio of more than two decades of concerts covering 40 countries on six continents. Tickets for each evening concert in the Arts Amplified Series will be $25, which includes same-day admission to the festival. Access to the Amphitheatre Stage will be open, 6:30 p.m. daily, and tickets are on sale through June 15 here. 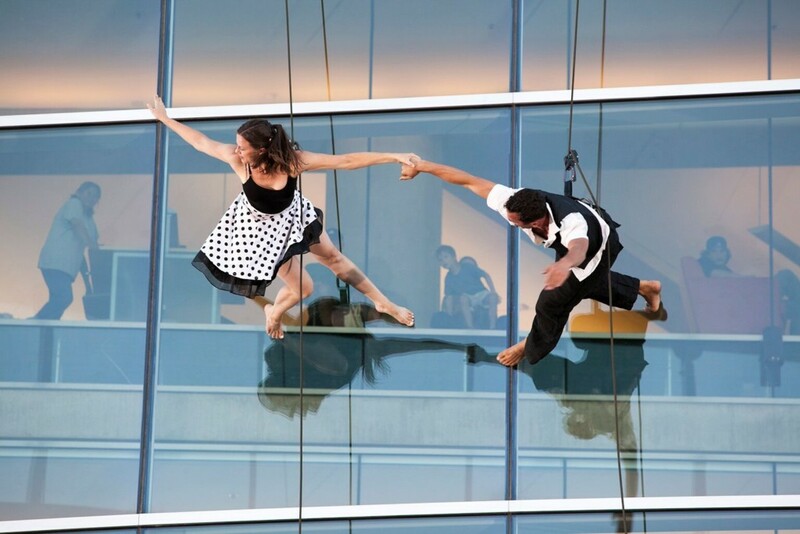 This year, the Oakland-based aerial dance artist group of Bandaloop, which performed five years ago at the festival, returns to its unique stage – the south-facing glass façade of the City Library. Bandaloop has grown its repertoire significantly since its last appearance, emphasizing its story-telling choreography with music commissioned by various composers. The group’s international presence was recently marked with a new short film, produced in collaboration with GoPro titled Dance on Budapest, shot on location during the CAFe Budapest Festival. Bandaloop will feature several new choreographed pieces during its shows, which will take place twice daily on Library Square. Bandaloop, 2013 Utah Arts Festival. Photo Credit: Utah Arts Festival. Among the more than 50 films being featured in Fear No Film are films from Vietnam, Malaysia, Ireland and Réunion Island, countries being represented for the first time, along with six films that will compete for Utah Short Film of the Year. Special artist exhibitions include sculptures by Utah artist Cordell Taylor and The Spirit of Dance, a special gallery showing sponsored by the Salt Lake City Public Library and created by New York City photographer Marc Santos. In addition to performing at the festival, Guy Davis, a standout American blues guitarist and banjo player, will be one of the instructors in the International Acoustic Music Association (IAMA)’s song academy. There also will be the IAMA’s Susanne Millsaps Performing Singer Songwriter Showcase on the Big Mouth Stage, featuring original songs from six former Millsaps competition winnners. IAMA’s collaboration with the festival marks its fifth year. The festival also champions many of Salt Lake City’s most critically acclaimed cultural assets. Dance gets its due merits with performances by the Repertory Dance Theatre, Salt Contemporary Dance, the Children’s Dance Theatre of the Tanner Dance Program at The University of Utah and The Bboy Federation. 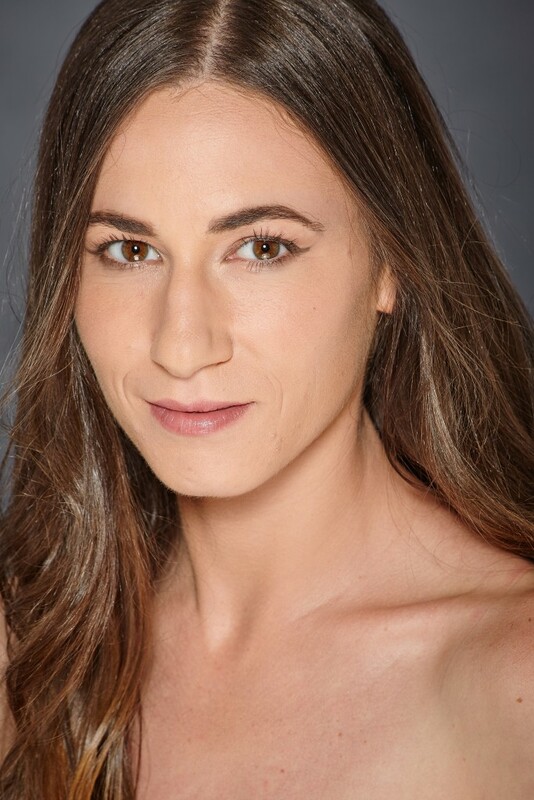 Ruuddances, LLC, which includes members of Ballet West and Ballet West Academy, will perform a program that includes this year’s world premiere dance commission by Peggy Dolkas, associate director and principal faculty with Ballet West II. Fear No Film, Topher Horman, coordinator. Photo Credit: Utah Arts Festival. The festival’s opening day will feature an evening appearance by semi-finalists of the 17th Gina Bachauer International Artists Piano Competition, which concludes June. 23. Music world premieres, commissioned by the festival, encompass works by Saad Haddad, a young composer who synthesizes disparate qualities inherent in Western art music and Middle Eastern musical traditions, and Melanie Shore, who is associate professor of jazz piano at The University of Utah. The Literary Arts venue will host the hugely popular individual and team slam poetry competitions. The festival has become an important stop for teams looking to compete in the national competition which will be held in Chicago in August. Newcomers to the Big Mouth Stage also include Write About Now, a Texas collective of poets, who will record other performances and share them on multimedia platforms and channels. Also on deck will be bassam, the 2016 national slam champion at the Canadian Festival of Spoken Word. 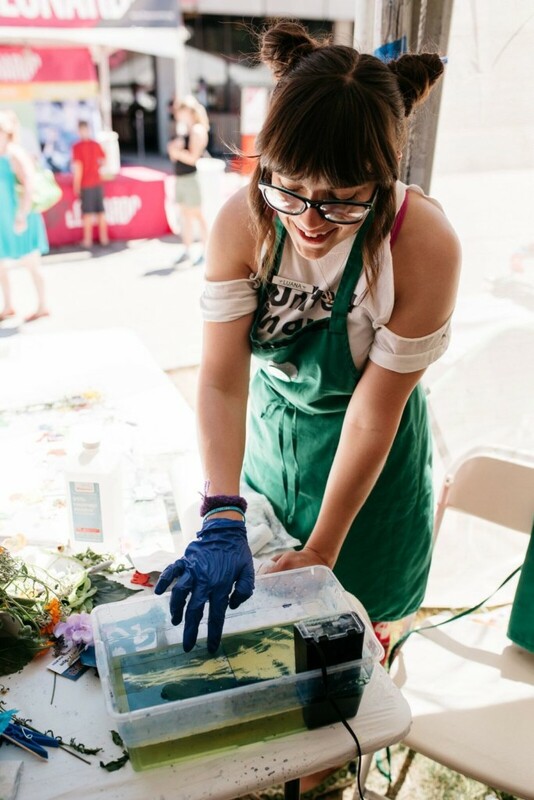 In recent years, the festival has expanded its offerings for visitors to make their own art. The Art and Technology venue returns with Make Salt Lake and Spy Hop Productions, sure to pick up the blistering pace of last year’s activities. In 2017, festival goers made more than 8,000 craft pieces from materials provided by the organizations. 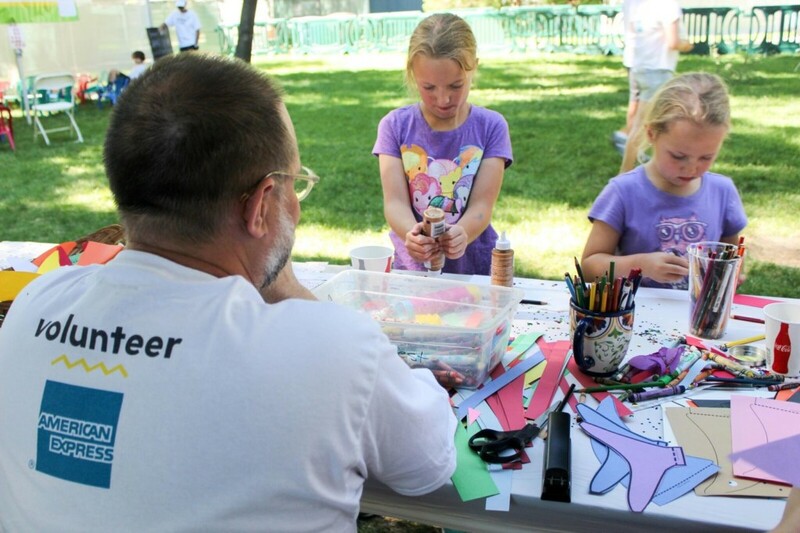 The Kids Art Yard is a hands-on model of creative projects made from upcycled materials and includes activities sponsored by Summerhays Music Center, Art Access, Craft Lake City, Tracy Aviary, Natural History Museum of Utah, Utah Museum of Fine Arts and the Utah Museum of Contemporary Art. The do-it-yourself vibe carries over to the Urban Arts venue, as visitors are invited to paint one of 100 plywood panels that will comprise the 100 Artists/1 Image community mural project conceived by local artist Mason Fetzer. 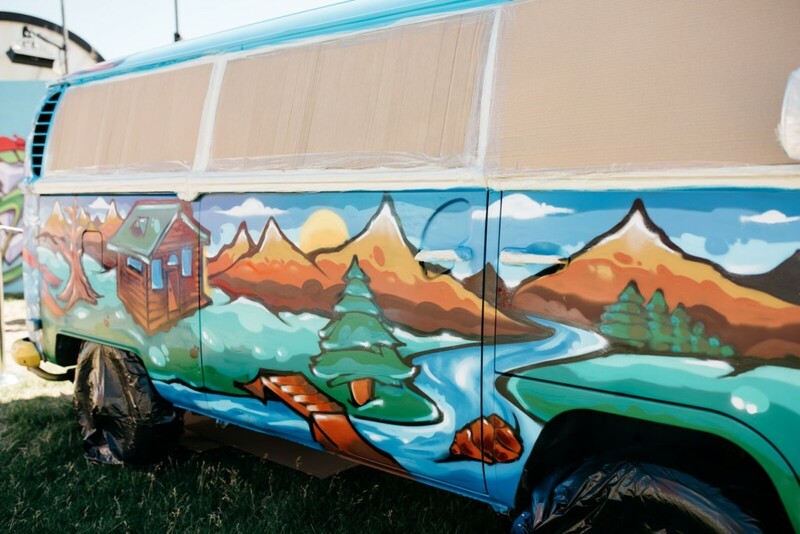 Graffiti artists will make over a classic Volkswagen Bug. Selections are made with a good amount of data and detail, including aggregated and averaged scores from jurors, artist background and pricing. The final decisions rest with Jacobson and Sarah Baker Taylor, his assistant coordinator. Jacobson’s quoted remarks are consistent with what he has said informally in recent festival years: “I want participating artists to have a good experience as well as the public.” He also encourages artists to be persistent, even if they might not be accepted in a given year. 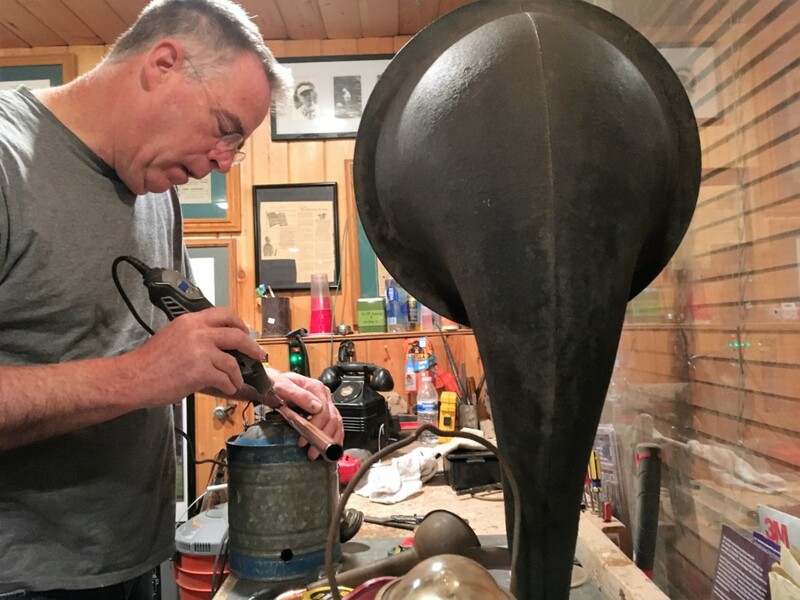 In the Sunshine Magazine article, he recalls a metal sculptor who was turned down seven times “because his slides were ‘incohesive.’” However, Jacobson said jurors carefully considered his submission in each cycle and he eventually was invited to participate. Frank Falk, a 2017 award winner returning this year to the Artist Marketplace. As for loyal festival enthusiasts such as Sayer, Major and Smithwick, they also have been members of the Friends With Benefits program, now in its ninth year. 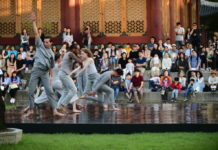 The program has become a vital springboard for the festival’s development program, which seeks to expand the individual donor base along with its ongoing corporate sponsorship program. Approximately two-thirds of the organization’s annual revenue comes from the festival but Aimée Dunsmore, development director, and Tennille Palmer, development manager, have shepherded fundraising efforts that are critical in ensuring the festival’s commitments to continuously improving and innovating programs are sustained. Going into this year’s festival, Dunsmore says preliminary figures for total fundraising are up by more than 1 percent from last year and seven percent above what was budgeted for the fiscal year. Final figures likely will be higher, based on income which will be booked for the Big Deal Brunch, a popular fundraising event held on the festival’s closing day. This will be the fifth year for the brunch. “Years ago, the festival tried a brunch but it never gained traction but as we have seen tastes and preferences evolve from year to year, the current Big Deal Brunch has been successful since we started it in 2014,” she explains. 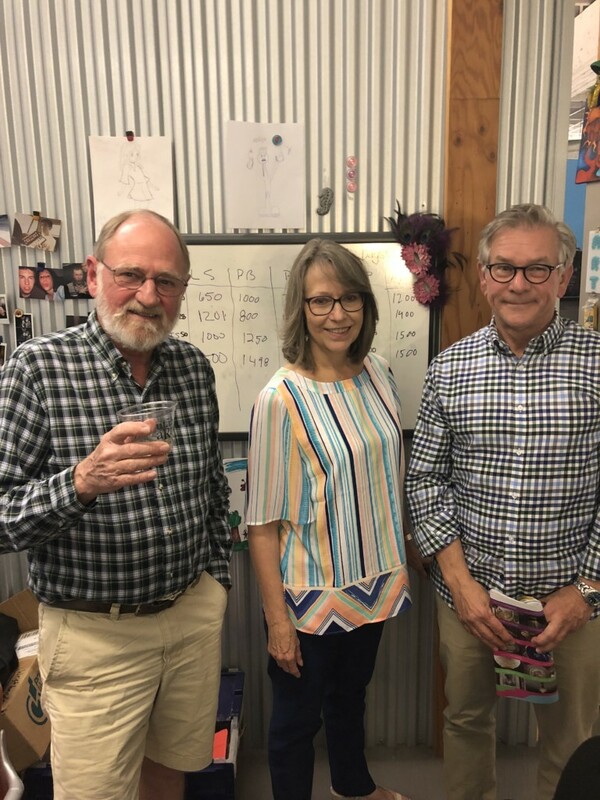 Harrison Smithwick, Karen Major, Steve Sayer (from left). Photo Credit: The Utah Review. An even more whimsical fundraising event also has taken hold. For the third year in a row, Friends Who Give A Crap will be available. For $75, a donor can sponsor a port-a-potty, and in return, will have their names featured on a unit along with a pair of festival tickets and a miniature commemorative foam potty. Dunsmore says donors like the humorous touch. This year, 80 units will be available for the campaign. The festival’s annual masquerade party, held in the winter close to Mardi Gras, also has become a successful pipeline for fundraising, which saw net income 18 percent higher than in the previous year. Dunsmore says the winter event has become more popular since it switched from a ‘Tardi Mardi’ theme to a more artistically-inspired frame of colorful masks and costumes. The festival’s other fundraising benchmarks have been just as positive. Foundation giving is up four percent and corporate fundraising is up by 9.2 percent over last year, far exceeding the typically conservative estimates Dunsmore makes in her budget planning. She says the unexpected larger boost in corporate sponsorship is likely due to the effects of the tax cut bill Congress passed late last year. Among the new corporate sponsors this year are Telemundo Utah, one of the state’s largest media outlets for Spanish-speaking communities; LeafFilter, the nation’s largest corporation for gutter protection; TopGolf, a popular entertainment company that has made competitive golf game events for families and organizations and Farmland, the nation’s largest agricultural cooperative. Dunsmore says that while some of these corporate sponsors might seem initially as unlikely matches for a statewide multidisciplinary arts and culture festival, she works closely with each sponsor to find the best fit that emphasizes community engagement as the primary basis for its presence at the festival. In addition, the festival received a $10,000 grant through the National Endowment for the Arts’ ArtWorks program. For the first time in five years, the festival has raised its ticket prices for adults. This is the 21st year in offering admission for free to children, 12 and under, thanks to the allocation of sales tax revenue earmarked for Salt Lake County’s Zoo, Arts and Parks (ZAP) program. Some 60 percent of festivalgoers take advantage of various ticket discounts and more than 7,000 tickets are given free to underserved and special needs populations. While the festival organizers have worked strenuously to hold ticket prices down as much as possible, the cost of staging the festival per person has increased dramatically within this decade – by as much as 60 percent to nearly $28 per person. General admission will be $15. Tickets for adults 65 and older and military are $8, also the price for the lunchtime special on Thursday and Friday, from noon to 3 p.m. A four-day pass is $50. The valet bike lot once again will operate with the aid of the Salt Lake City Bicycle Collective, which will entitle users to receive a $2 discount on regular festival admission. The service has grown steadily over the last few years and organizers expect as many as 4,000 festival patrons will use the bike lot. Also, festival volunteers for the Earth Team continue to educate patrons on how to dispose of recyclable waste properly. Last year, more than 18 tons of plastic and cardboard, along with two tons of glass and 700 pounds of green waste were recycled. Follow The Utah Review daily from now until the end of the festival for comprehensive previews and ground coverage during the event.